Getting a nice flagpole from the start ensures a nice display for the long haul. 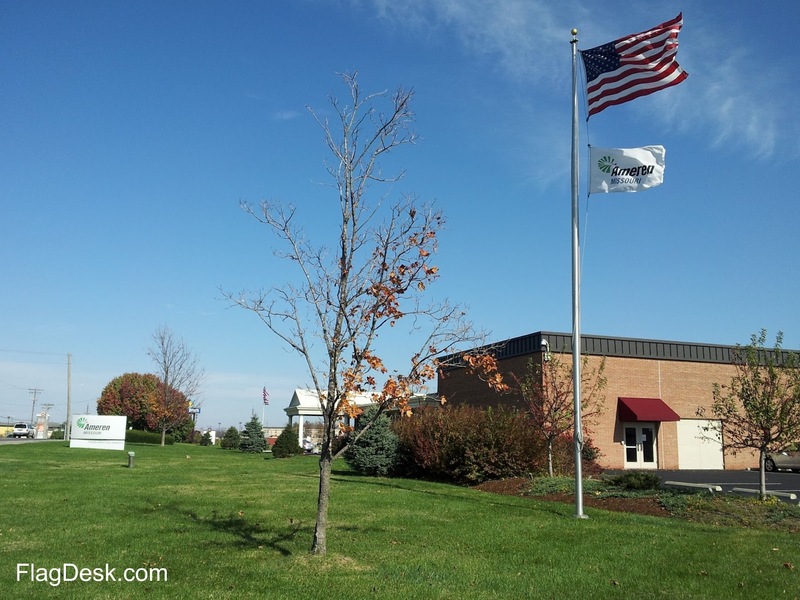 This clear anodized flagpole shows little stain or show scratching while a standard spun satin aluminum would have a much easier time staining. You can see this here at the Gerber Collision & Glass Auto body shop. So what are some of a flagpoles silent enemies? If your flag is located on the lawn outside your building, chances are your flag display is threatened by lawn mowers, edging tools, shovels, and cars. But what you may not be aware of is your water source. Iron-rich water, fertilizer, and other lawn care treatment will stain your flagpole. Creating natural barriers from these things is a great idea. We've seen walkways, pedestals, large boulders, and fencing used to protect the flagpole. A new-looking flagpole makes for a new-looking building. At the Gerber Collision & Glass, you can tell they try and keep the flagpole in shape. New snap hooks were tied in a square not to the halyard. But the old ones were left on only by their eye-lit. This is because once you tie a snap hook to halyard, it is virtually impossible to remove it, adjust it, or prevent it from getting in the way.